Warning: when you go barking up the holiday tree, this addictive seasonal sweet may fall from its branches. Whip up a few batches to make the chocolaty crunching the soundtrack of your holiday season—trust us, you’re going to want plenty to share and keep in reserve. Line a baking pan with wax paper, and cover bottom with ⅓ of your peppermint candy. Double-boil milk chocolate chips and half of your powdered sugar over lightly boiling water until melted, being careful to stir often and scrape the sides with a rubber spatula. Once the chocolate is melted, add in oil and stir. Pour chocolate over the peppermint candy and add another layer of peppermint candy on top. Refrigerate for 30 minutes. Melt your white chocolate the same way you melted the milk chocolate, using the other half of your powdered sugar and mix in the peppermint flavoring. Pour it over your hardened peppermint bark along with your caramel sauce. Sprinkle the rest of your peppermint over mixture and refrigerate again for approximately one hour. Once the white chocolate has hardened, break it up and serve! 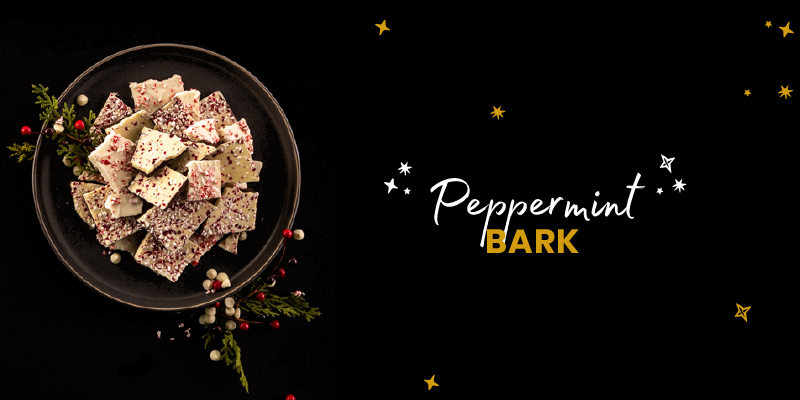 Get everything you need to make our Chocolate Crunch Peppermint Bark online or in store!